The Outlook add-in allows you to email links to files and folders using your Microsoft Outlook application. When you use this feature, you can share links to synced content, as well as local content, directly from within your email platform. The Outlook add-in can be installed independent of the desktop client. It is a stand-alone application, and can therefore be used to send share links from Microsoft Outlook without fully downloading content to the local machine. Alternatively, the Outlook add-in can be installed alongside the desktop client, giving you multiple options for local sharing and collaboration. Using the Outlook add-in, you can send links—rather than standard attachments—to files and folders of any size, so you can share content that would otherwise be blocked by Microsoft Outlook. You can even ensure security by sending secure share links, so that all recipients must log in before accessing the shared content. In this way, you can safely work and share items from your email client, but with more options and configuration settings. As an added benefit, the Outlook add-in keeps track of the items that you have shared by creating and populating a Shared Items folder in your Synced Folder. 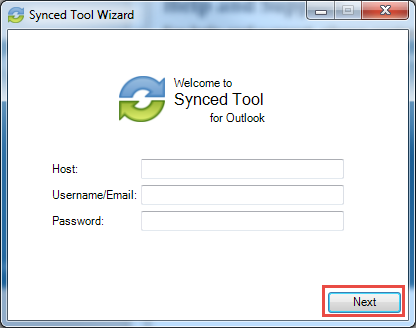 Because the Outlook add-in integrates with Synced Tool, you always have a backup of your content without needing to store or search for attachments within your email client. Note: The Outlook add-in can be installed in Microsoft Outlook versions 2010+ (Windows 32-bit and Windows 64-bit environments) with .NET 4.7.1 version or higher. Microsoft Outlook for Mac does not support third-party add-ins. Note: Disabling the Outlook setting, Use Cached Exchange Mode, will prevent the add-in from generating share links when composing emails. When sending share links to multiple email addresses, or to a distribution list, each recipient will receive a unique share link. Note: While the Outlook add-in recognizes individual email addresses associated with standard distribution lists, members of a dynamic distribution list will not receive share links as expected. Unlike regular distribution lists, which contain a preset list of members, dynamic distribution lists generate a membership list at the time the email is sent, based on the filters and conditions that have been defined in Active Directory. This process prevents the Outlook add-in from generating unique share links as expected. As a workaround, when sending a share link to a dynamic distribution list, we recommend creating a share link through the web portal, and copying and pasting this share link into the body of the email message. For more information, please reference the How Do End Users Share Content Knowledgebase article. Note: You can optionally configure the Outlook add-in so that all items are sent as secure shares; however, if the Force New Share Links to Require Login policy is enabled for your organization, this feature is turned on by default, and is not configurable by end users. 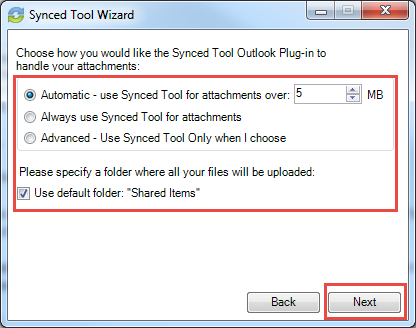 Additionally, when configuring attachment policies, you can determine how the Outlook add-in manages your sent content. When you send items through the Outlook add-in, a new Shared Items subdirectory is created for you in your Synced Folder. 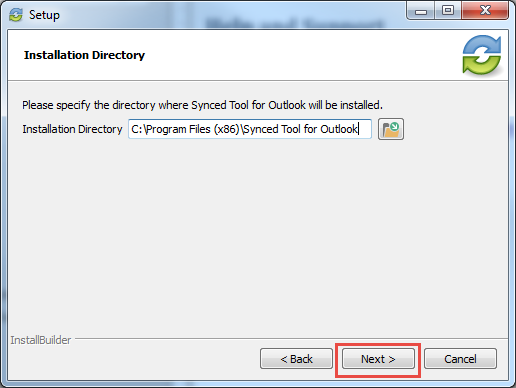 By default, this folder is located at the top-level of your Synced Folder, but you can change its location when you configure your Outlook add-in preferences. Automatically use the Outlook add-in for attachments over a certain size, even when an email draft already includes a standard attachment (for example, when forwarding messages). The add-in will automatically convert these attachments to share links, and store these items in your Shared Items folder. Automatically use the Outlook add-in for all attachments, even when an email draft already includes a standard attachment. The add-in will automatically convert all attachments to share links, and store these items in your Shared Items folder. Only use the Outlook add-in when selected. Browse and select a local file stored on your machine. Convert an item to a share link, which is particularly useful when forwarding email messages that originally included a standard attachment. You can decide to manually convert these items using the Attach drop-down menu, or this will happen automatically, depending on your attachment polices. Note: When you send local files, or convert an item to a share link, they are then stored as Synced Tool content in your Shared Items folder. Before you can use the Outlook add-in, you must first download it from the web portal. Click the Download App button in the web portal. The Download page displays. In the Download page, click the Outlook button. The file will start to download, or you will be prompted to save the file, depending on your browser type. 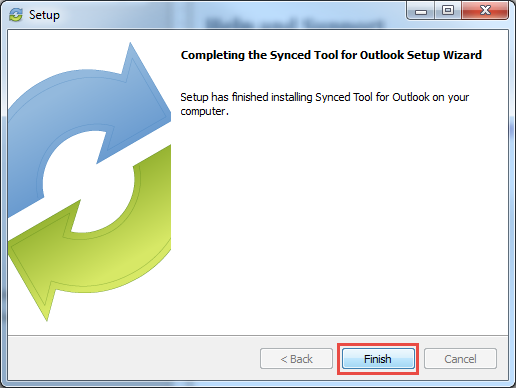 When the file finishes downloading, make sure Microsoft Outlook is closed, and click the installation file. The Setup Wizard opens. 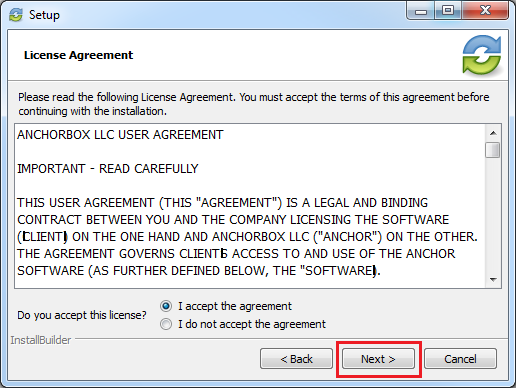 In the License Agreement screen, click the I accept the agreement radio button if you accept the license. Then, click the Next button to continue. In the Installation Directory screen, select the location where you want the installation files to reside on your local machine. In most instances, you can accept the default location. Click the Next button to continue. In the Ready to Install screen, click the Next button to begin the installation process. 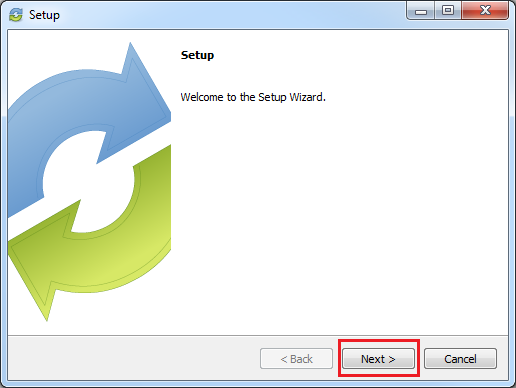 When the Setup Wizard completes, click the Finish button. In some instances, you might need to restart your MS Outlook application. 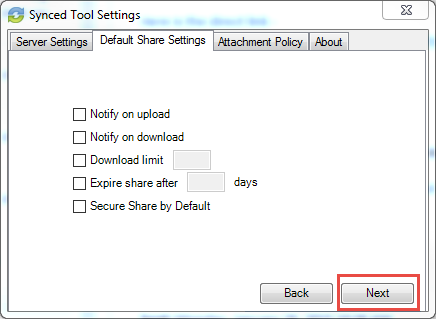 After you install the Outlook add-in, you can configure default share settings and attachment policies. When you launch Microsoft Outlook for the first time after installing the Outlook add-in, the Wizard displays, prompting you for login credentials. If prompted, enter the organization host name in the Host field (for example, syncedtool.com/). Note: In most instances, this field will be pre-populated with the appropriate host name. In the Username field, enter the same username that you use to access the web portal. In the Password field, enter the same password that you use to access the web portal. In the Choose your Default Share Settings screen, set default settings for how you share links. Click the Notify on upload checkbox to receive notifications when a file is uploaded to a shared folder. Click the Notify on download checkbox to send notifications when the share is downloaded. Click the Download limit checkbox, and enter a download limit number, to limit the number of times the share is downloaded by each recipient. Click the Expire share after checkbox, and enter a number of days, to set a share to expire after the specified number of days. Click the Secure Share by Default checkbox to send all content as secure shares. If this option is selected, all recipients will be required to log in to access the shared content. A recipient who is not a member of your organization will be added as a guest user; a guest account will be created for the recipient, and login credentials will be provided. Note: If the Force New Share Links to Require Login policy is enabled for your organization, this feature is turned on by default, and is not configurable by end users. In the next screen, set default attachment policies. Click the Automatic radio button to automatically use the Outlook add-in for attachments over a certain size, even when an email draft already includes a standard attachment (for example, when forwarding messages). The add-in will automatically convert these attachments to share links, and store these items in your Shared Items folder. Click the Always use for attachments radio button to automatically use the Outlook add-in for all attachments, even when an email draft already includes a standard attachment. The add-in will automatically convert all attachments to share links, and store these items in your Shared Items folder. Click the Advanced radio button to only use the Outlook add-in when selected. Click the Use default folder checkbox to use the default location for storing shares configured from Outlook. If you uncheck this checkbox, you will be prompted to select another location on your local machine. When the Wizard completes, click the Finish button. In Microsoft Outlook, create a new email message. The ribbon will display an Attach drop-down button. Click the Attach drop-down button, and select Send a File. The Account Browser dialog box displays. In the Account Browser dialog box, select the content you want to share. 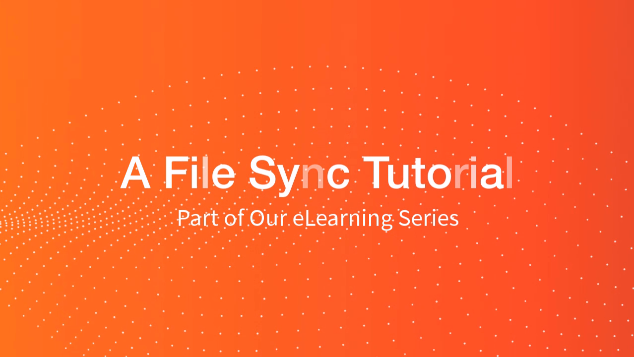 To attach a file or folder stored in Synced Tool, click to expand the My Files folder, or the Team Shares folder, and select the appropriate content. To send a file from your local machine, click to expand This PC. You can then browse and select a file on your machine. Optionally, you can change your default share settings by clicking the Change Share Settings checkbox. Alternatively, to convert an attached item to a share link, click the Attach drop-down arrow and select Convert to Synced Tool File. Any attached item will automatically convert to a share link, and will be stored in your Shared Items folder. 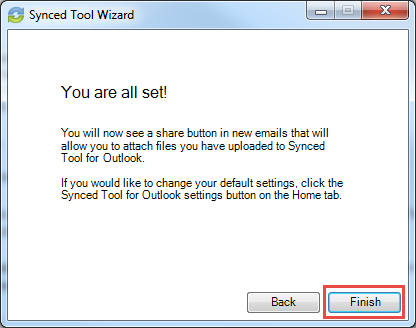 Click Outlook's standard Send button to send your email. 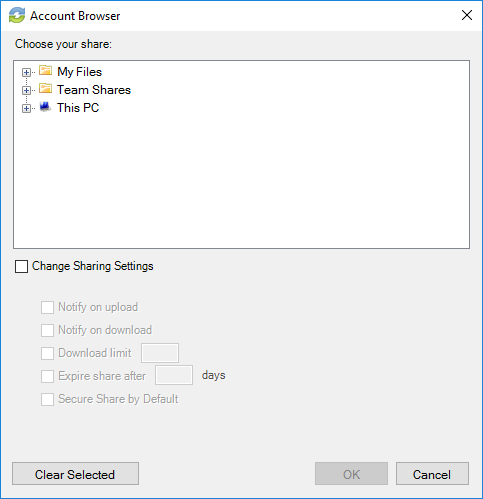 If you have selected to send a secure share to an entire folder (rather than a single file), a Secure Share Settings dialog box will display, prompting you to configure permission for each recipient. You can set upload permissions, which allows recipients to upload content into the shared folder, or delete permissions, which allows recipients to delete content in the shared folder. Optionally, uncheck the ALL Recipients Settings checkbox if you would like to configure separate permissions for each recipient. Recipients of a standard Outlook add-In share link will receive one email message, which includes the body (full thread) of the email and a URL to download the shared file or folder. Separate email messages ensure that the links are sent securely, and the full body of the email thread is preserved. Note: If a recipient is an outside user, the system will automatically create a guest account for that user, and he or she will receive a third email indicating that a guest account has been created.